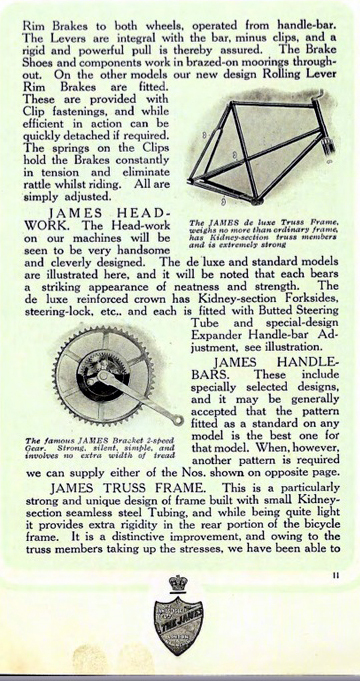 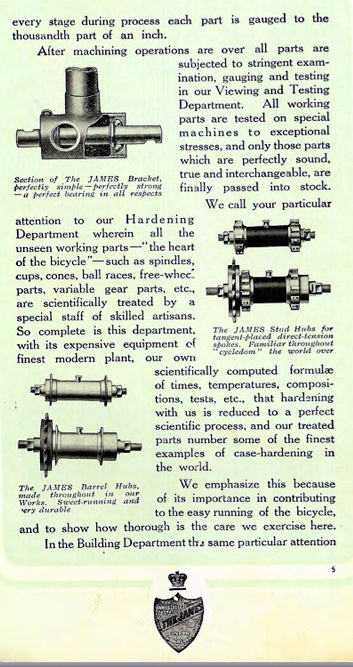 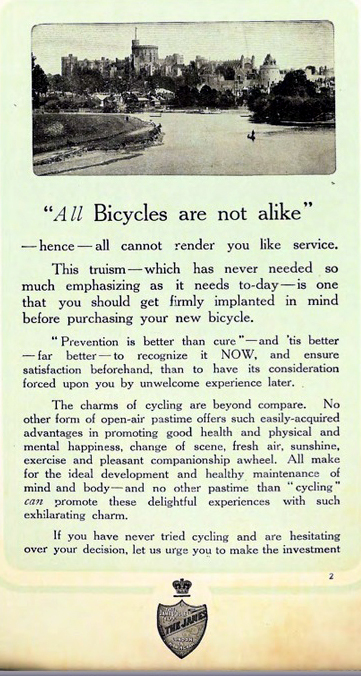 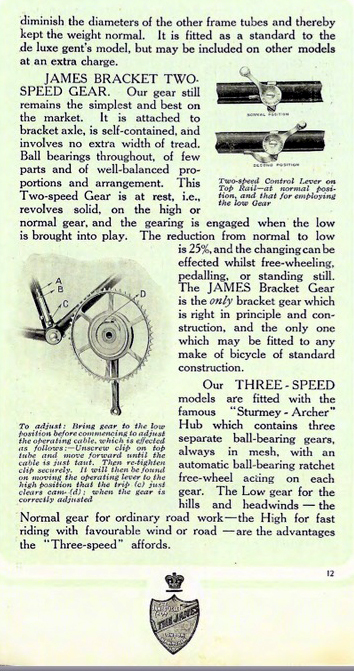 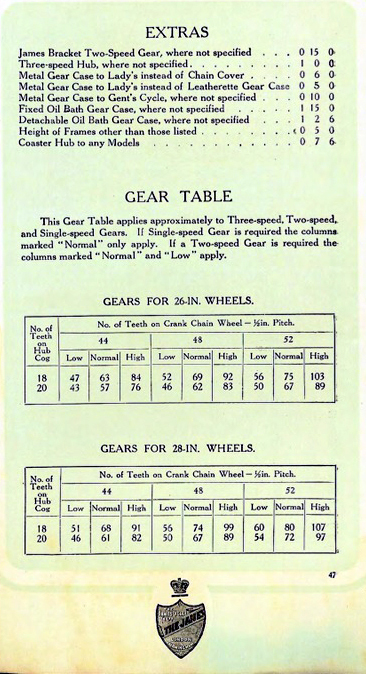 Some time after finding this bicycle, I came across the 1913 James catalogue featured on this page. 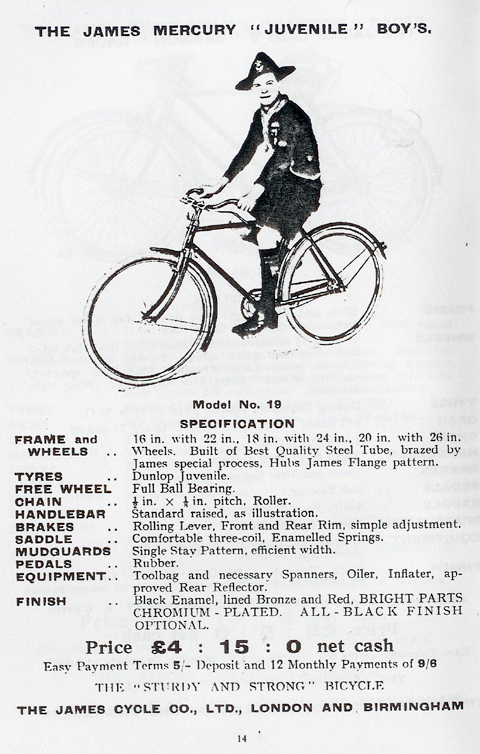 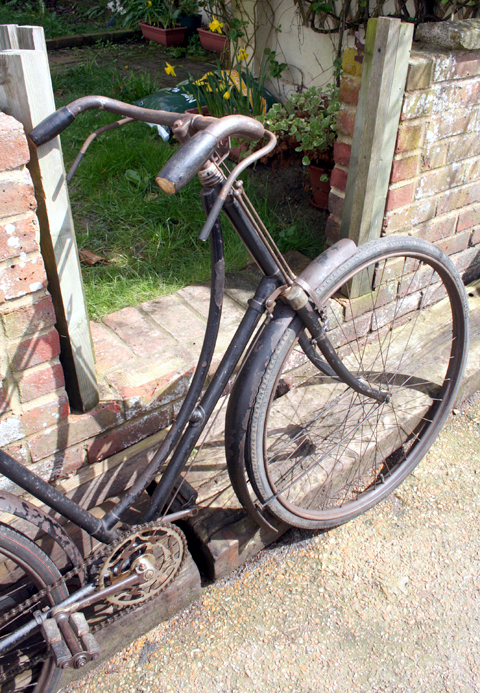 It’s notoriously difficult to date most bicycles and identify the actual model. 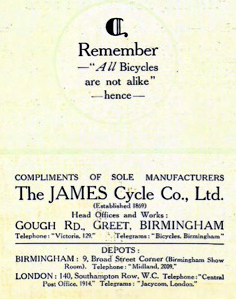 Many manufacturers didn’t stamp the frame numbers in a logical progression; in addition, bikes were sometimes bought in from other manufacturers and re-badged. 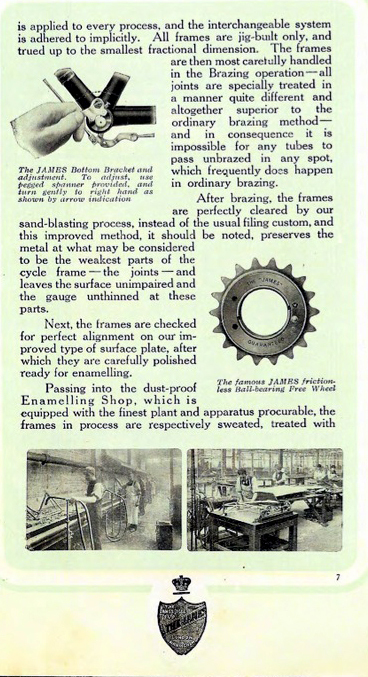 Records of most companies’ frame numbers were subsequently lost. 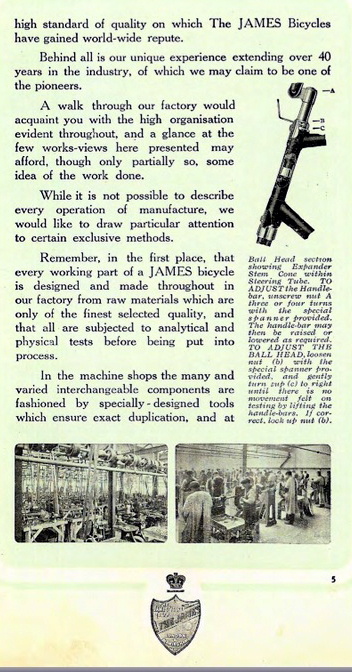 And of the various models available in any one year, customers could specify any number of extras and variations – which often blurred the distinction between models. 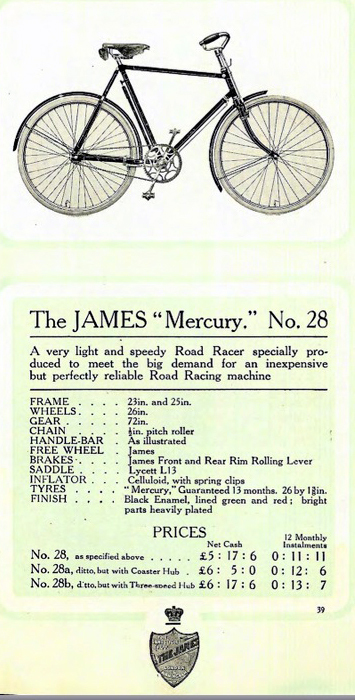 I have a strong interest in Mercury cycles. 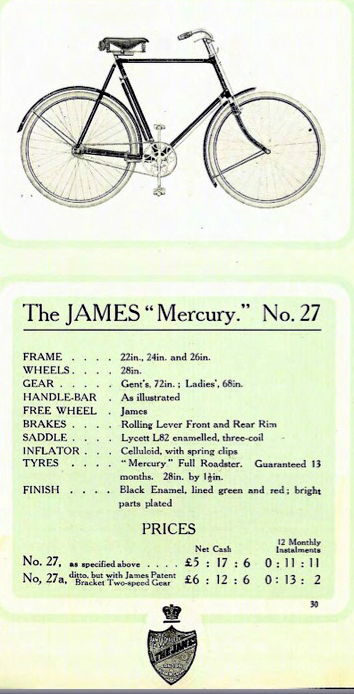 So when I saw that James’s low-price model was named ‘Mercury’ – and realized that it looks very similar to this one – I decided that mine could well be a James Mercury No. 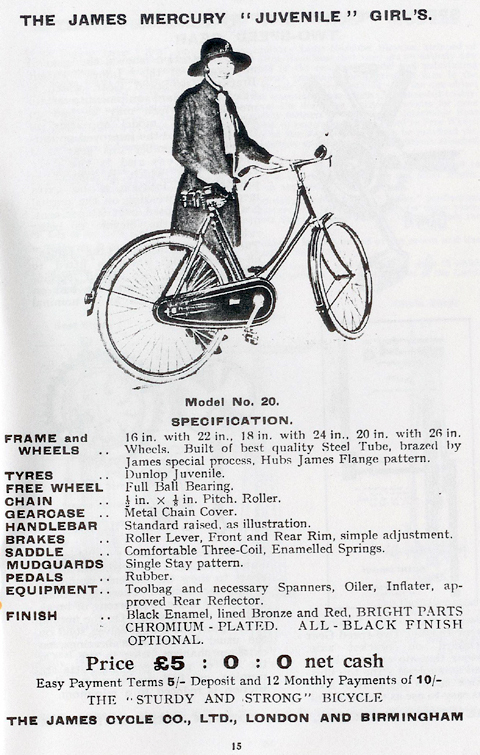 29 without the full chain-case illustrated in the catalogue. 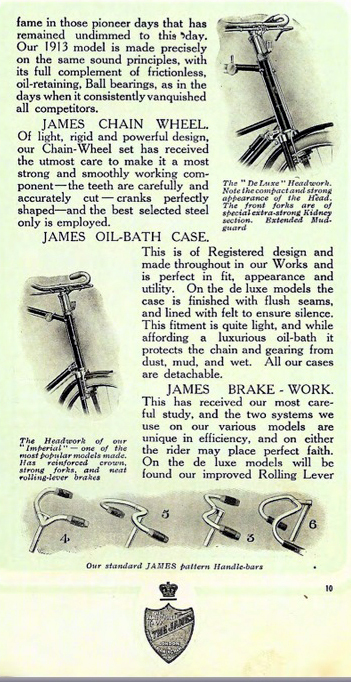 (The Gents models have no chain-case). 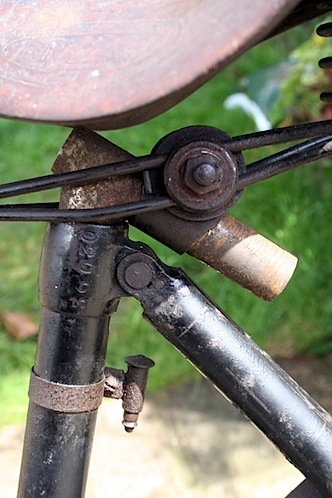 You can see the distinctive ‘J’ on the lamp bracket, above. 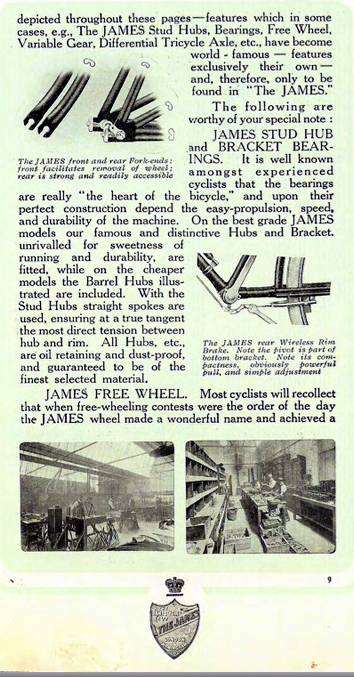 Much James advertising was aimed at female riders. 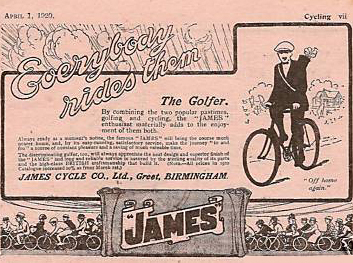 The holiday ad below suggests ‘James riders are always assured of a really good time.’ Remember that individual transport for women was a comparative recent concept at this time (and in 1914 bicycles were still not cheap enough to be affordable by the masses). 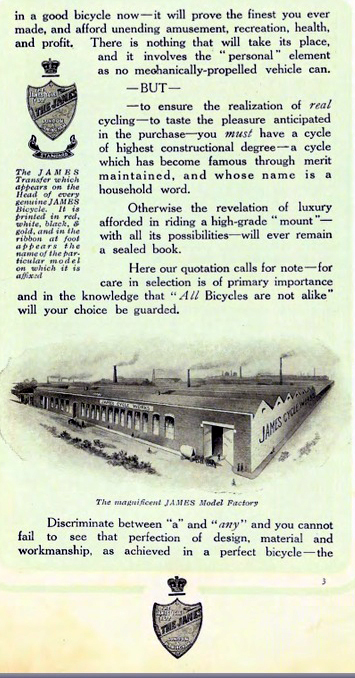 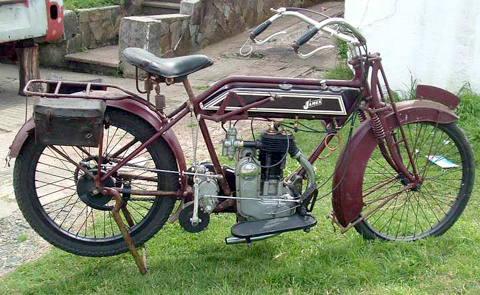 Obviously, most of the more successful companies moved into motorcycle production, so the focus of their histories usually relates to motorized transport, with only passing mention of bicycle production. 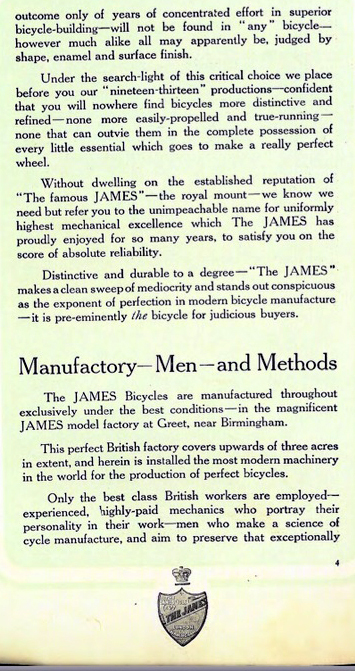 Nevertheless, as histories of bicycle manufacturers are not always available, I’ll include the company history in full. 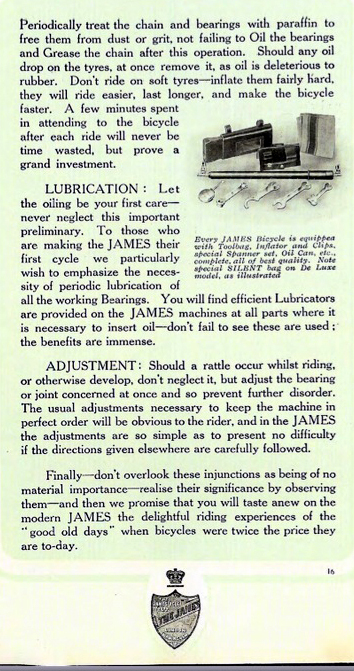 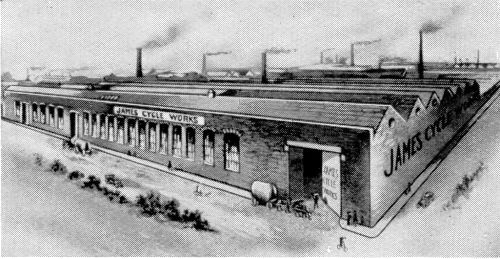 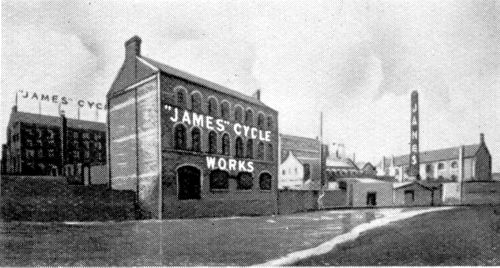 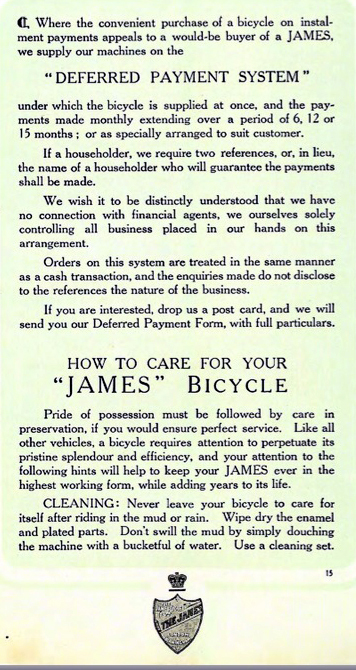 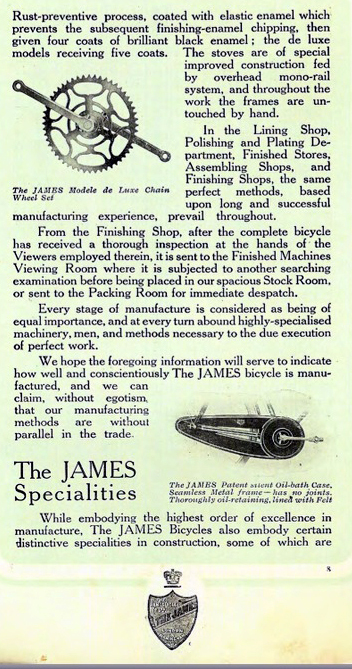 Here, below, with thanks to the authors of the above website, is the history of James Cycle Co Ltd. 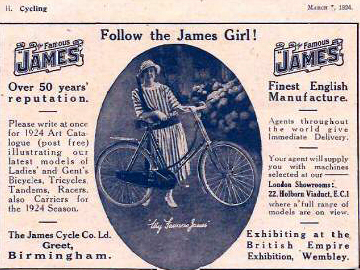 I also have this 1907 James Gents. 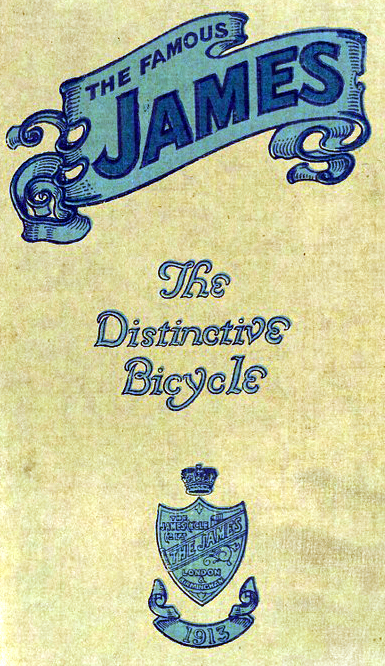 In due course, I’ll take some pictures of the two of them together and update this page. 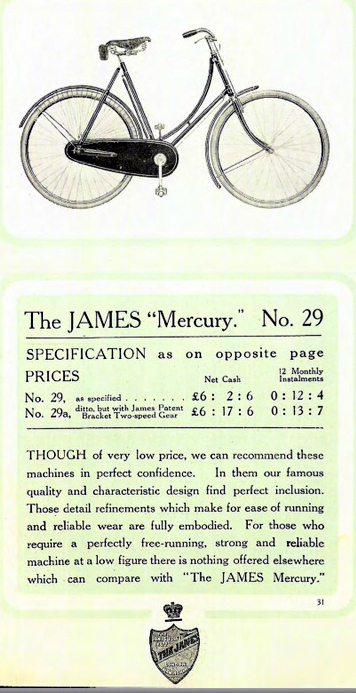 It appears that James brought the name back again for their juvenile models, as I found these two James Mercury models in the 1932 catalogue.